Weekends are always relaxing. With little worries about deadlines and less running around there is always a lot of spare time for personal work. 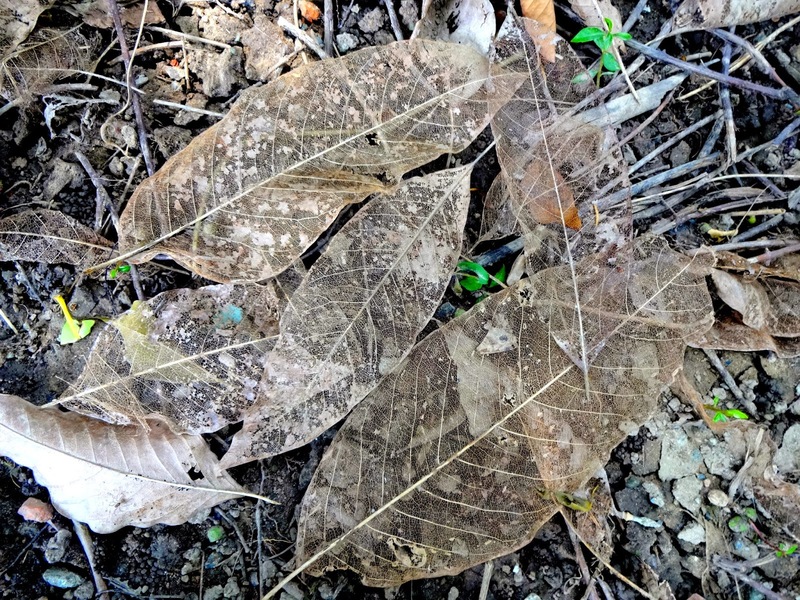 While lopping the wayward branches of trees, we came across a heap of leaf skeletons. We were enthralled as much as intrigued to see how beautifully the skin had come off revealing an intricate network of veins that make up the structure of the leaf and transporting vital nutrients to the plant. We started picking them up carefully, selecting the ones that were not damaged for using them as bookmarks. A good downpour left the surface of Earth wet and sweet smelling. Water collected in the leaves shone like gems as the rays of the Sun fell on them….a strong gust of wind had them all rolling down and falling in unison like a freak meteoric shower. I made Cinnamon Coffee Cake. 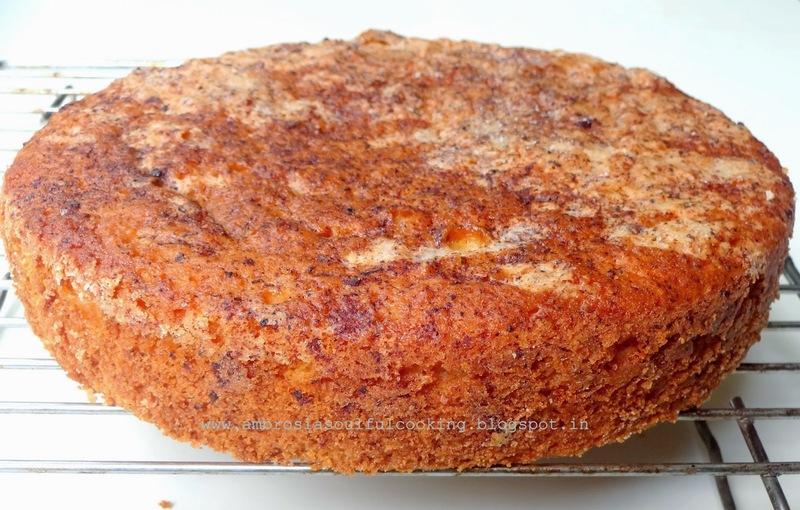 A simple and lovely cake that is easy to bake and great in taste. Pre heat oven to 180 degrees C. Grease and line one 6 inch round cake pan. Whisk together all-purpose flour, baking powder, ½ teaspoon ground cinnamon and salt. In a deep bowl mix butter, milk, egg and powdered sugar. Add dry ingredients and stir till you get a smooth lump free batter. Do not over mix. Pour in the prepared pan. Sprinkle ½ teaspoon cinnamon and 2 tablespoon sugar. Bake for 25 minutes. Insert a skewer to test for doneness. Cool in the rack, slice when cold. My notes: 3 teaspoons of baking powder looked too much to me. But the cake rose very well and tasted very good. The crumb was light, airy and a little dry. I was looking to bake a small cake for my colleagues and this one sounds perfect for it! Got to make this today! Coffee Cake!! I baked a coffee cake too two days back :) What lovely fragrance, right?! I like the addition of cinnamon into the coffee cake. I made a Coffee Almond cake, will be posting the recipe soon. And those leaf skeletons... what beauties! Nature is simple marvelous and I love the way you admire and photograph all the beauty it has in offering. Thanks for sharing it with us too! Love the fresh feel of your blog and the extremely doable healthy recipes! Just baked this coffee cake with my kids. Used whole wheat flour and the results are unbelievable light and fresh! Thank You Chandra! I also believe in baking cakes with whole wheat flour. The cake tastes a lot better, is healthier and is filling! I liked the fact that you tried it out with atta. hi namitha - I stumbled upon you blog through one of your posts in the artisan bread page in FB. I love your blog and it is very refreshing to visit. 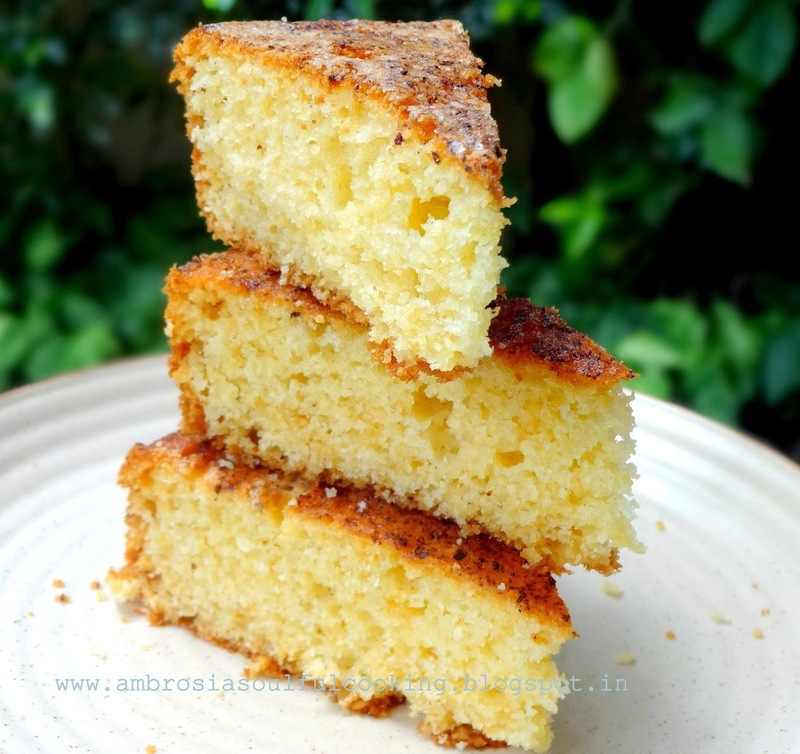 It has been a long cherished dream for me to live near the himalayan foothills and live my dream vicariously through your blog :) I also share your passion for baking breads, and find your recipes very simple, honest and soulful. Specific to this recipe, have you tried an eggless version? I am thinking of substituting 1/4 cup curd for an egg in this recipe. Any suggestion? Hello Prasanna, Thank you for your lovely comment that made me smile :). Yes, living in the Himalayan foothills is a great experience. The avian fauna, the birds, butterflies are your companions. We do lack the amenties of a big city but living with nature is soothing. Prassana, yes, go ahead with curd, start with 1/4 cup and adjust the quantity to get the right consistency. Hope the egg less version comes out well and you enjoy it. Hi namitha.. love ur blog as well love this cake.. Please help me out to replace the egg in this. Thanks a ton and thanks in advance. Hello Madhu, This cake is flavourful and very light. From my experience, i can say that the recipes where eggs are used as binding agents, flaxmeal (1 tb flaxmeal stirred in 3 tb water) works wonders. How ever i have not tried this one without eggs. I would suggest that you go ahead with flaxegg. Hope the cake comes out well. Do share your experience. Happy Baking! Hi Avni, ha ha ha ....i loved your sense of humour :) Avni, in the beginning, 3 teaspoons of baking powder looked on the higher side to me. But the cake came out well though a little dry. Good you had it with chocolate sauce. In case if you wish to try it again, reduce salt and add 1/4 teaspoon only. I guess that would be the right quantity. Hi! Thank you for visiting my space and for your kind words. In the beginnning, i too thought that coffee cake must have coffee as one of the ingredients. But later realised that coffee cake is so called because it is served with coffee. This is a lovely cake. Hope you try it out and enjoy it! Hugs and best wishes! Hi Namita, I started loving cake making after coming across your blog and trying few recipies. In the above cinnamon cake can we use another alternative for egg? 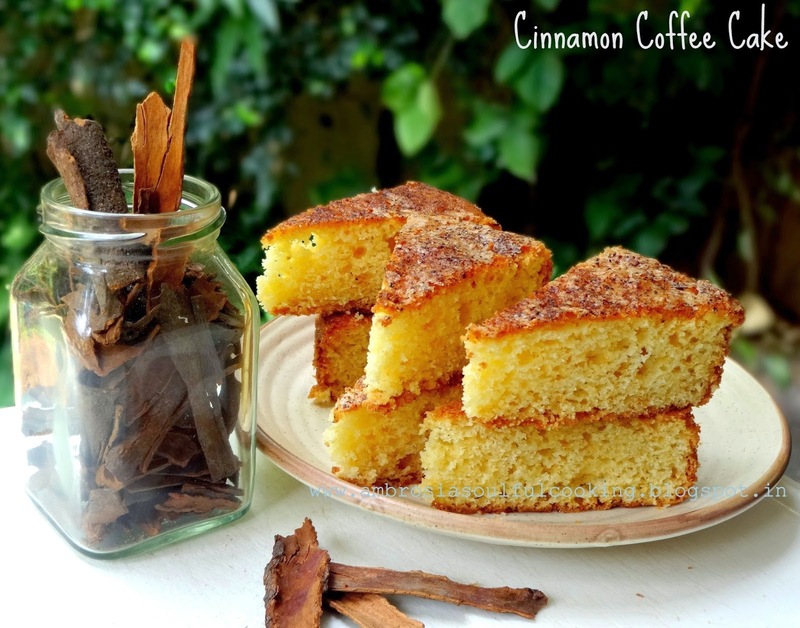 I want to bake an eggless cinnamon cake. Hello, I am so happy that you have started baking and wre loving it. In this recipe, you may use 1/4 cup thick curd in place of an egg. You can also use flax egg. To make one flax egg take 3 tablespoons water in a bowl. Add 1 tablespoon of raw flax meal. Whisk with a fork. Refrigerate. This step is important. Refrigerate for about an hour. This gives it the consistency of an egg white. Add it to the recipe. It acts as a binder and makes the cake soft.